Power and Comfort are the two words that describes the works of Racormance. They are one of the first custom bike manufacturers that uses a combination of Basalt Fiber and Carbon Fiber. Racormance is the number one bike manufacturer in Spain. Their bikes allow the rider to ride comfortably and also has an optimised pedalling force that gives more speed to the bike.Their handmade bikes come in different sizes, to suit the measurements of the rider. – Marketers who are personalizing their Web experiences and who are able to quantify the improvement see, on average, a 19% uplift in sales. In the course of their business they realized that customers came with various requests and specifications regarding the ideal bike they wanted to purchase.They wanted custom bikes which they could ride comfortably. The length, the transmission group and so on, were little details that changed a lot for a customer to consider purchasing a bike.Therefore Racormance needed a plugin that would enable them to display all the available options their customers have been requesting for.Woocommerce Product Configurator gave them the tools they needed. With their project in mind, they asked for an advanced customization of the online product designer. 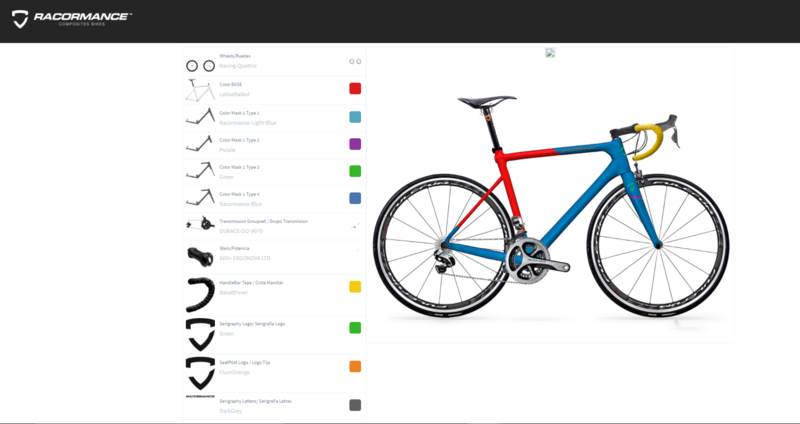 To enable their customers to choose their bike options for total comfort.Their customers are able to change colors of the different bike parts, choose the wheels of your choice, the transmission groupset and the power. But they also give further personalizations if requested by the customer. Whether you sell e bikes, performance bikes, or dirt bikes, no matter the type of the product you sell on your Woocommerce WordPress shop, our online product designer is able to give you a tailor made solution. If you have any question, feel free to ask using the comments section below.Note: the features described in our case studies are personalisations (custom works) of the plugin requested by the clients. They are not available neither in the standard version nor the free version of the plugin. Oh? How did you find us then?